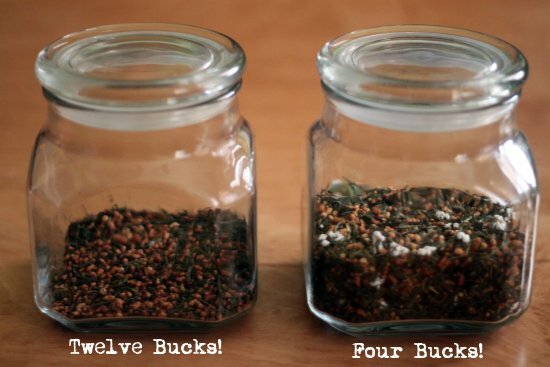 FrugaliTEA Experiment: Expensive Tea vs. Cheap Tea. Fight! I was feeling down for a couple of weeks. 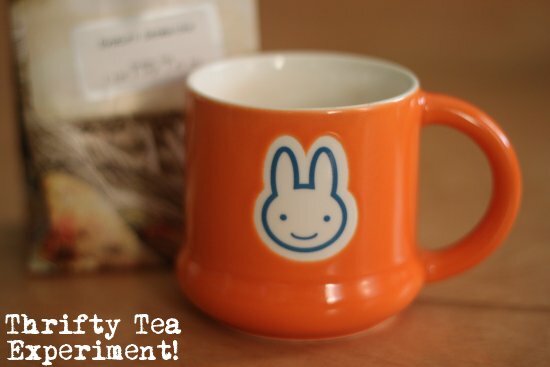 I couldn't put my finger on it until I prepared some Earl Grey tea. After the tea, my depression instantly lifted. 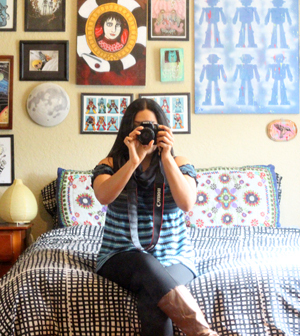 Revitalized, I cleaned the whole house, then crafted nonstop. My depression was Tea Withdrawal! A real disease for the tea obsessed. 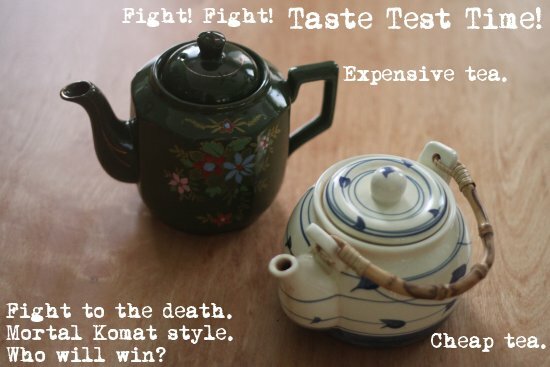 I love tea so much that I think I'm more excited about serving quality tea at my Thrift Core Shop than anything else! 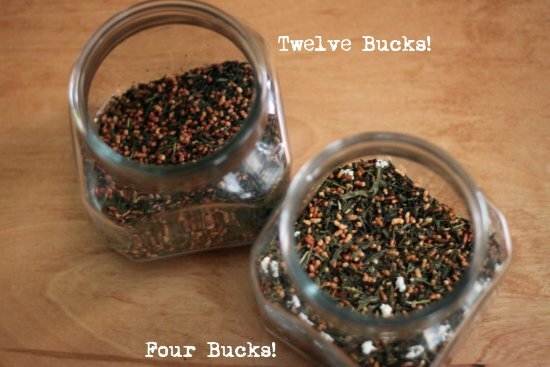 I refilled my tea stock yesterday when I realized Teavana restocked Genmaicha. A staple "poor man's tea." I figured it was the type of tea no one could "get wrong." The brown bits you see are pieces of toasted brown rice and the white bits are popped rice; genmaicha is nutty, brothy, light-bodied tea. So delicious in fall, or anytime! The Taste Test: Using the same amount of tea and water, I brewed my tea. At first, they tasted identical. 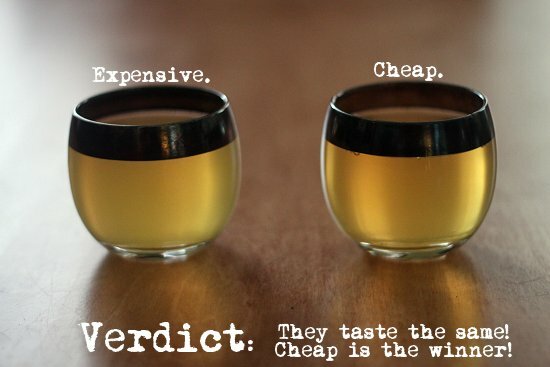 After a few more tastings I determined I like the cheap tea a little bit better. As you can see, you get way more tea for your money with the economical tea. 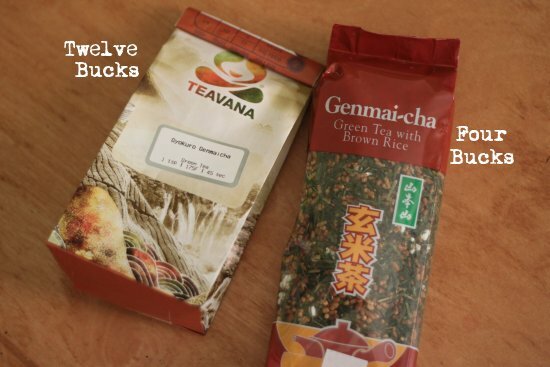 If you're a genmaicha fan, get the cheap stuff! Ah, warm tea with my friends gathered as we craft up a storm for the holidays. Sounds like heaven! What's your favorite cold weather warm treat? What's your favorite tea? Oooh! I love tea too! One of our favorite cheapy store bought tea is the Good Earth original Sweet & Spicy. It's Cinnamon & Orange spice. Sweet with no sugar. Our other go to is Japanese Sencha Green Tea. We like the Teavana brand of that one, but tend to try new ones from the Asian markets so I have no idea what the actual brand is since I can't read Japanese. Hot cider is the best. I have to say a really good hot cocoa is my favorite way to warm up. As to my favorite tea - definitely Irish Breakfast Tea. Your findings are quite interesting, though. They are something to keep in mind the next time I buy tea. You've solved a mental health crisis! Nice experiment! I do enjoy a hot cup of tea. And I'm a total sucker for Teavana's Samurai Chai and Snow Geisha blends. But I cannot get over the prices. $20 for 1/4 pound? Yikes! Jackie: I know, right? I'm on the hunt for cheaper suppliers. If anyone has any suppliers of quality tea to share, please don't hold back! Simmer spices in boiling water for 15 mins. Add black tea and steep for not more than 3 minutes. Steeping more than 3 min. release tannin in tea and it can be bitter. Have your strainer ready and strain out the tea and spices with care and timeliness. Add the milk and honey (gently warmed together before adding)to tea. Victoria: Heck yes, thank you for sharing that! Definitely going to have to try it, sounds spicy and delicious. Blue Eyed Night Owl: I looove collecting tea supplies like a true nerd. Mmmm, delicious tea! Nothing beats a good cup. We have a great tea shop in Toronto that sells incredible blends like Toasty Almond (chunks of nuts, fruit, vanilla, etc) and Earl Grey Rooibos - so good! I think you're onto something great having yummy teas in your shop, as they're hard to come by. Try padutchteaspicecompany.com! Dozens of tea flavors for awesome prices. I used to work there!